Earlier this week, I covered a tip for lightening your travel load by making your AirPort Express Base Station serve double duty as a USB charger. 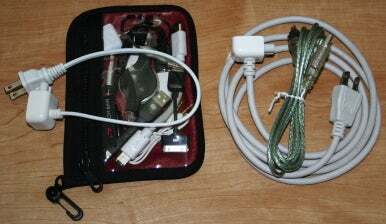 But another place you can cut back is cables, which, collectively, can add a surprising amount of weight to your laptop bag—not to mention more than a little clutter. The challenge for me—and for many road warriors, I’d bet—is that I hate to be on a trip and realize that I don’t have the right cable for something I need to do. So as much as I want to leave certain cables at home, I’m paranoid that the one I leave behind will be precisely the one I desperately need just before my big presentation. Fortunately, there’s a good middle ground. Instead of carrying fewer cables, I carry smaller cables. A 6-foot FireWire cable? Try 6 inches. A tangled-up iPhone cable? I prefer a 3-inch connector. Swap out a couple bulky, lengthy cables for smaller versions (or just-as-capable adapters) and you’ll cut down on a bit of weight and bulk. Swap out all of your cables for travel-friendly versions, and you’ll be amazed at how much lighter your laptop bag is—and how much neater it is, as well. To give you an idea of what I’m talking about, here’s a photo of the various cables and cable adapters I carry with me these days, along with a short description of how I use each one. A. Twelve-inch cable for Apple’s laptop power adapters If I could, I’d always use my MacBook’s power adapter with just the pop-out plug. Unfortunately, not all power outlets are accessible enough, or provide enough clearance, to let me plug in the adapter directly. But Apple’s extension cable is long, bulky, and heavy. The foot-long extension cable shown here is a perfect compromise, giving me just enough length to clear the blocking-the-outlet nightstand in most hotels while taking up a fraction of the space of Apple’s cable. Unfortunately, the cable is available only as part of Incipio’s Continential Companion Cables, a set of international adapters for Apple’s AC adapter. Hopefully the company will consider selling it separately in the future. B. Six-inch FireWire 400 cable with adapters Unlike the latest models, my MacBook still has a FireWire port. But instead of carrying a bulky 6-foot cable, I tote this 6-inch version that came with a Belkin hub I purchased long ago. To make sure I can connect to any kind of FireWire device, I also have a FireWire 400-to-800 adapter and a old 6-pin-to-4-pin adapter; I use the latter for connecting my DV camera to my MacBook. C. Retractable Ethernet cable Wireless is great, but frequent travelers know there are times an Ethernet cable can save the day. A retractable, flat-cable version takes up little room in your bag. I purchased this generic 4-foot model for around $3 online. D. Compact USB-to-USB-mini cable I have a number of portable gadgets—hard drives, batteries, and more—that connect or charge using a mini USB cable. I found this 3-inch version several years ago at a Macworld Expo booth. F. USB Extension Cables I’m cutting down on cable length, but I’m bringing extension cables? Unfortunately, some USB devices don’t share space well with others; their plugs are so bulky, they block adjacent ports. So I always bring a couple six-inch USB extensions, just in case. 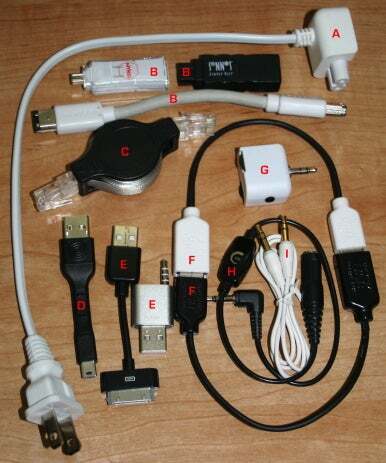 I can also use these extensions with any of my compact USB cables and adapters, if necessary. G. Headphone splitter When I travel with family or colleagues, we often want to share our audio. I like this splitter because it’s compact and gives each person his or her own volume control. It’s no longer available, but Radio Shack sells an inexpensive alternative. H. Headphone volume control When I fly, I use in-ear-canal headphones, which let me listen comfortably at low volume levels. Unfortunately, the headphone jacks on many airplane seats seem to have only two volume levels: really loud and really, really loud. This handy cable lets me attenuate the volume to listenable levels. I bought it for a few bucks many years ago, but, like the previous item, you can get one from Radio Shack. I. Audio cable I often find myself needing a stereo minijack-to-minijack cable; for example, for connecting audio sources to my MacBook, or for connecting travel speakers to laptops and iPods. The one I carry is pretty low-quality—it came with a cheap audio accessory I’ve long since stopped using—but the cable’s thinness means it packs small. This may seem like quite a bit of gear, but the picture to the right shows how much space everything takes up in my bag, compared to just Apple’s extension cable and the FireWire cable for my DV camera. I’ve got everything but the power cable in a 5- by 7-inch Tom Bihn Clear Organizer Pouch; the clear side panel is useful at airport security checkpoints. The biggest caveat to going small is that your range is limited. For example, my DV camera or iPod has to sit right next to my MacBook while connected. I rarely find this to be an issue, though; I've usually got my computer and all its accompanying gear on the same desk or table—often the only desk or table—in my hotel room. What I found interesting while going through these items is how many I didn’t buy separately. Many were accessories or extra parts for products I already had, which reduced the cost of assembling the bundle. But even if you don’t have any of these cables handy, a quick browse of OWC, MonoPrice.com, Meritline, and Amazon will find you similar versions at reasonable prices. One item I don’t carry with me is a cable with a USB type B connector, the kind you generally use to connect a printer or a non-portable external hard drive to your computer. I figure that if I need to connect to such a devices while I’m out and about, the owner will likely have the cable. By carrying these “ultralight” versions of cables and connectors, I lighten my load and keep my bag neater, but I also feel better about bringing connection options—such as FireWire 800 and 4-pin FireWire—I might have left at home before. But even if you don’t go to the extreme that I have, hopefully I’ve given you some ideas for saving space. Swapping out just a couple cables for smaller, lighter alternatives can make a noticeable difference inside your bag.